Heed the call of the wild…discover the second book in this action-packed animal fantasy series from the #1 bestselling author of Warriors! 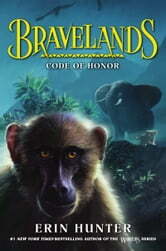 Set in the African savannah and told from three different animals’ points of view, Bravelands will thrill readers who love Spirit Animals and Wings of Fire, as well as the legion of dedicated fans who’ve made Erin Hunter a bestselling phenomenon. A baboon who has uncovered an act of treachery. An elephant uncertain of her fate. The code of the wild has been broken. The elephant leader known as Great Mother has been murdered. And Bravelands is on the edge of chaos. Now a young baboon, elephant, and lion must come together to discover the truth—before the fragile balance of Bravelands is destroyed forever. So amazing ,adventers,mistery,sadness and more!!! !